High school students are urging their classmates not to turn a blind eye to bullying. 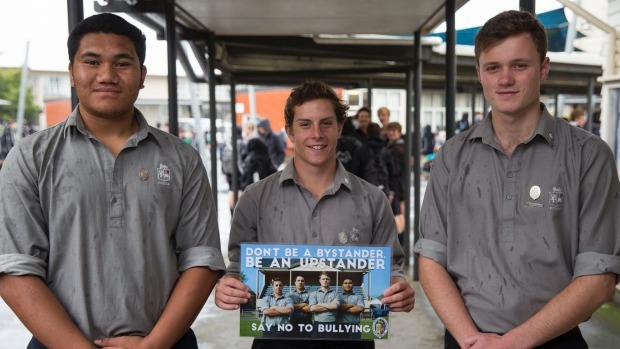 Palmerston North Boys’ High School has adopted a new anti-bullying campaign and it is already working. The campaign – Don’t be a bystander, be an upstander; Say no to bullying – encourages the boys to stand up if they see something, rather than ignoring it. Head prefect Patrick Takurua said they made a presentation to their fellow students last week. “The feedback has been quite overwhelmingly positive. “After the presentation one guy came into the counsellor with another boy and said ‘I’ve been doing the wrong thing’. Deputy rector Gerard Atkin said the idea behind the campaign was to stop it before it became a problem. “We are not that naive to say there is no bullying here. Atkin said it built on themes that the school had of brotherhood and being a family. “You stand up for people in your family. The message behind the campaign is that bullying can only succeed ‘behind a cloak of darkness’. Atkin said it was the responsibility of the students to look out for each other. The campaign had also promoted good discussion with parents, he said. He hoped the message would go beyond the school gates. “It can be pretty difficult, but it is about being upstanding and saying this is not OK,” deputy prefect Greg Shaw said.